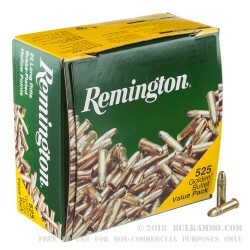 This .22 LR ammunition from Remington comes in a huge bulk priced 6300 round case (12 boxes of 525 rounds each) that makes the already-inexpensive .22 LR even more affordable. You'll really have to work at using up this much ammo! 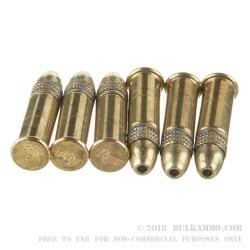 Each cartridge fires a 36 grain brass plated hollow point bullet suitable for both target shooting and varmint hunting. 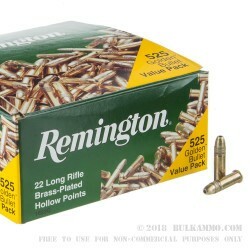 Remington Golden Bullets are manufactured in Lonoke, Arkansas using rimfire-primed brass cases. These are the new and improved version designed to provide better reliability and accuracy. This is very good ammo. Very well pleased. Best for hand gun self defense ? Q: I would like to know if this ammo is waxed or heavily oiled, and what is the MV . Also if I can get a discount if I buy more then one order of 6300 ? A: This ammo has an electroplated brass finish on the bullet, instead of wax or oil. Muzzle velocity is 1280fps. Yes, a discount is automatically applied on orders of more than one case. 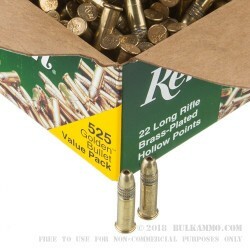 A: It would probably be best to use two separate .50 caliber ammo cans for this much .22LR, unless you had access to a 20mm or 37mm ammo can, which would be more than enough for this much ammo. A: 22LR ammo will be in demand forever. Q: I have purchased a box of this ammo in the past. I noticed that, in several of the cartridges, the bullet turns freely in the case - it does not come out and it appears to be seated to the same height as any of the other rounds. I have not fired any of these rounds. Before I do, my question is: are these rounds safe to fire? A: It would be advisable to fire rounds with "rotating bullets" through bolt action or single shot firearms only, as they may not feed properly in semi-autos. Also, if they have been exposed to moisture, they may fail to fire at a higher rate than other ammo. Q: If you sight in your .22 rifle at 50 yards with a scope. Is there a formula to calculate the drop at 100yards? A: Zeroed at 50 yards, a 22LR high velocity bullet will drop approximately 4 inches at 100 yards. A: Yes. There are many .22LR rifles and pistols, and this ammunition would work well in both. However, it is important to check whether the weapon is chambered for .22LR or some other type of .22 rimfire such as .22 Short or Magnum/WMR. While .22LR (22 Long Rifle) is very common, there are many examples of the other types on the market. A: A comparison for what would make a good self defense load or caliber is what would work to hunt a deer. Both deer and humans are light, thin-skinned animals that weigh ~150-250lbs. Because of shallow penetration and a complete lack of expansion, almost all .22LR ammunition would be a very poor choice for the ethical and quick killing of a deer. It would also be a very poor choice for the immediate incapacitation of a large, violent human attacker. Of course, .22LR ammunition is lethal and has the potential to succeed in both cases, but that potential is quite low. Q: I am a gun newbie. If I want a good stock of .22 LR, what is the advantage of hollow point? A: Hollow point ammunition is a little better for hunting small game than standard round nose 22LR. It will offer a little expansion in some cases, which can do more damage and make for cleaner kills. Q: Have there been any formal tests done with this ammo as a self-defense option ... sure it is easy to know that a 9mm (in a semi-automatic weapon will do the job) - but, what about the 22 as an ammo (weapon) of choice ... just curious .. eh !!!!!!!! A: We are not aware of any formal testing with Remington Golden Bullet .22 LR as a self defense load. .22LR is generally regarded as a poor choice for self defense. Q: I notice that these are hollow points and I know hollow points are supposed to expand. My question is, How efficient is that expansion in a .22 cal and does it really make much difference? A: In certain cases, a hollow point may be added to a projectile design for reasons other than expansion. Some projectiles have a hollow point for accuracy or precision purposes. These Remington .22LR HP cartridges may exhibit moderate expansion ranging from .25" to .30" depending on velocity and what the projectile hits.